Travel Agencies in London, United Kingdom. Outbound tour companies in London, England. Find the best travel companies UK for tailor made tours, corporate tour agency, air ticket deals, hotel booking, Eurostar tickets and more travel related services from London based travel agents. Offers organised trips, tailor made trips and corporate travel solutions. Discover Italy. London based independent tour operator & travel agent for your personal travel. Services includes flights, hotel booking, and bespoke travel and tour programs. 75 Bryan Avenue, London NW10 2AS, England. AWL TRAVEL has over 40 years of experience and specialize in journeys to and within Japan as well as tailor made packages. Euro-Japan Holidays (Japanese department), deals with air tickets to all over the world in addition to hotel bookings, Eurostar tickets and original package tours to Europe and South Africa. 140 New Cavendish Street, London W1W 6YE, UK. 100 years of touring experience, Australia & New Zealand guided holidays, short breaks, one day and half day sightseeing tours across Australia including Sydney, Melbourne, Cairns, Darwin, Uluru, Alice Springs, Perth, Adelaide, Brisbane and the Gold Coast. Wells House, 15-17 Elmfield Rd, Bromley BR1 1LS, UK. Able Can Travel offers full travel arrangement services to world destinations. Also offers low cost flight booking, hotel booking and car hire from leading worldwide car hire companies. Expert on travel to Africa. Offers Africa overland tours, small group tours, short safari & treks, city stays and tailor made packages. Country covers – South Africa, Uganda, Tanzania, Malawi, Zambia, Botswana, Namibia, Zimbabwe, Kenya, Mozambique, Swaziland and Lesotho. One of the world’s leading and long established global travel management and events businesses. Specialises in corporate Travel, Corporate Event Management, Travel services for the Shipping sector, Online Travel Technology, Specialist Travel for the Energy & Offshore Industry, and Sports Event Management. Travel Agency in London, United Kingdom. The UK’s largest group of independent travel agents. With a network of over 700 leisure & business travel members. 21 Provost Street, London N17NH, England. A specialist ski holiday company and winter sports travel agency based in Battersea, London. Travel Company in Wimbledon, United Kingdom. Offers Ski Holidays, Summer Activity Alpine Holidays, Beach Holidays, Yachting / Sailing Holidays. Opening hours : Monday-Saturday (9am-6pm), Sunday (Closed). ALTOUR is New York based one of the largest independent tour and travel management company. A boutique travel company which specialises in creating authentic, tailor-made holidays in Colombia. London based leading travel specialist offering the most competitive discounted rates on flights and hotels throughout the World. Anemone Holidays specialises in holidays To Cyprus, Greece (Athens, Aegina, Agistri,Spetses, Porto Heli, Poros, Halkidiki, Santorini), Dubai, European Holiday Destinations & Worldwide. Atlantis Travel of London Ltd. Luxury holiday travel company in Chigwell. Specialise in luxury cruises and holidays. Fully licensed and bonded with the Civil Aviation Authority, IATA and ABTA. Atlas Travel UK offers global travel management, meetings & incentives, vacations & cruises services. Small group tour company in London. 25 years+ experience in small group and tailor-made tours across the UK and Europe. Level 1, 107 Power Road, London W4 5PY, United Kingdom. Holidays to the Balkans. 51 years of holidays to Bulgaria, Croatia, Montenegro, Slovenia, Macedonia and Romania. Sofia House, 19 Conduit Street, London W1S 2BH, United Kingdom. 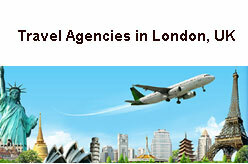 Travel Agency in London, United Kingdom. Established in 1883, Baxter Hoare Travel specialise in organising worldwide bespoke holidays for individuals. Services includes business travel, leisure travel, event travel, sports travel etc. Travel Company in London, United Kingdom. ATOL, ABTA and IATA accredited. Bespoke luxury itineraries for leisure clients and travel management service for corporate clients. Luxury Holiday Destinations are Africa & Indian Ocean (Mauritius, Morocco, Seychelles, South Africa), Asia, Central & South America (Argentina, Brazil, Chile, Costa Rica, Ecuador, Mexico, Peru, Uruguay), EU & Eastern Europe, Middle East, North America (Florida, New York, United States), OCEANIA (Australia, French Polynesia), THE Caribbean (Anguilla, Antigua and Barbuda, Barbados, Saint Lucia, Saint Martin, Saint-Barthelemy, Turks & Caicos Islands). Fully ATOL and ABTA bonded travel agency in London, United Kingdom. Tailor-made holidays around the world, multi-centres & hotel breaks to the Middle East, Caribbean, Indian Ocean, Asia, Central & South America, North America, Canada, Europe, South Africa, Namibia, Tanzania, Zimbabwe. 7-9 Whitfield Street, London W1T 2AS, United Kingdom. Hanoi, Vietnam based travel agency and office in London. Offers customised guided tours to Thailand, Indonesia (Bali), Indochina, Burma, Singapore, Malaysia, Hong Kong, China and Japan. Single country tour and multi-country tours available. Capable Travel are experts in travel to South America, group travel and corporate travel management. Offers late deals, flights, package holidays, cruises, ski-ing, continental cities or UK short breaks, or tailor made travel arrangements worldwide and more. UK’s leading independent holiday company arranging bespoke holidays since 1979. Specialising in luxury tailor-made holidays to the Caribbean, Mexico, Europe, USA, Indian Ocean and Arabia. The Point, 210 New King’s Road, London SW6 4NZ. Independent travel agent for worldwide business and leisure travel, TOURIST VISAS, WORKING HOLIDAY VISAS and MULTI STOP VISAS; based in London, United Kingdom. Destinations are Dubai, Barbados, Mauritius and many popular places around the world. Visit website to see the TRAVEL DEALS OF THE WEEK. One of London’s leading independent travel management companies offering tailor-made services for busy executives. Award winning travel company in London, United Kingdom. Stag weekends, Hen weekends, Adventure weekends, Group holidays, Special occasions, Events, Corporate events, Team building. 41a Maltby Street, London SE1 3PA, England. Australia based travel agency in the UK. All Antarctica Cruises, All Arctic Cruises, South America Multi Country, Central America Multi Country – Expedition cruises, tours and more. 15 Theed Street, London SE1 8ST, England. Destinations are Beijing, Shanghai, Guilin and Yangshuo, Hong Kong, Suzhou, Hangzhou, Sichuan province, Tibet, Silk Road, Yangtze River, Xian, Sanya, Yunnan, Taiwan, South Korea. Offers Tailor-made tours and Small Group Tours, Private China Tours, Hong Kong Tours, Taiwan Tours, South Korea Tour, Backpacker Tours etc. Find more travel agents here. Page updated : 11th March, 2018.